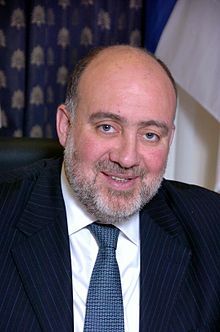 ISRAELI AMBASSADOR PROSOR ADDRESSES THE UNSC…….. – The Tundra Tabloids……. ISRAELI AMBASSADOR PROSOR ADDRESSES THE UNSC……..
How any Israeli diplomat can remain diplomatic within that international cesspool, is beyond me. It’s a testament to their fortitude. In the barren deserts of the Middle East, myths find fertile ground to grow wild. Facts often remain buried in the sand. The myths forged in our region travel abroad – and can find their way into these halls. I would like to use today’s debate as an opportunity to address just a few of the myths that have become a permanent hindrance to our discussion of the Middle East here at the United Nations. Make no mistake: it is important for Israel and the Palestinians to resolve our longstanding conflict for its own merits. Yet, the truth is that conflicts in Syria, Yemen, Egypt, Bahrain, and many other parts of the Middle East have nothing to do with Israel. It is obvious that resolving the Israeli-Palestinian conflict won’t stop the persecution of minorities across the region, end the subjugation of women, or heal sectarian divides. Obsessing over Israel has not stopped Assad’s tanks from flattening entire communities. On the contrary, it has only distracted attention from his crimes. And dedicating the majority of this debate to the Israeli-Palestinian conflict, month after month, has not stopped the Iranian regime’s centrifuges from spinning. Iran’s ambitions for nuclear weapons are the single greatest threat to the Middle East, and the entire world. In fact, numerous international organizations have said clearly that there is no humanitarian crisis in Gaza, including the Deputy Head of the Red Cross Office in the area. Gaza’s real GDP grew by more than 25 percent during the first three quarters of 2011. Exports are expanding. International humanitarian projects are moving forward at a rapid pace. There is not a single civilian good that cannot enter Gaza today. Yet, as aid flows into the area, missiles fly out. That is the crisis in Gaza. And that is what keeps Gaza from realizing its potential. It is a simple equation. If it is calm in Israel, it will be calm in Gaza. But the people of Gaza will face hardship as long as terrorists use them as human shields to rain rockets down on Israeli cities. Each rocket in Gaza is armed with a warhead capable of causing a political earthquake that would extend well beyond Israel’s borders. It will only take one rocket that lands in the wrong place at the wrong time to change the equation on the ground. If that happens, Israel’s leaders would be forced to respond in a completely different manner. Today, I’d like to save the Human Rights Council and the international community some time and energy. The facts have already been found. They are plain for all to see. The fact is that from 1948 until 1967, the West Bank was part of Jordan, and Gaza was part of Egypt. The Arab World did not lift a finger to create a Palestinian state. And it sought Israel’s annihilation when not a single settlement stood anywhere in the West Bank or Gaza. You will never hear Palestinian leaders say “two states for two peoples”. You won’t hear them say “two states for two peoples” because today the Palestinian leadership is calling for an independent Palestinian state, but insists that its people return to the Jewish state. This would mean the destruction of Israel. Ladies and Gentleman – the Palestinian leadership has never said publicly that they will give up the so-called “claim of return” – neither to the Palestinian people, to the Arab world, to the international community, or to anyone else. Since the Palestinian leadership refuses to tell the Palestinian people the truth, the international community has the responsibility to tell them the truth. You have a duty to stand up and say that the so-called “claim of return” is a non-starter. Instead of telling the Palestinian people the truth, much of the international community stands idle as the Arab world tries to erase the Jewish people’s historical connection to the Land of Israel. Across the Arab world – and even at this table – you hear claims that Israel is “Judaizing Jerusalem”. These accusations come about 3,000 years too late. It’s like accusing the NBA of Americanizing basketball. Like many nations around this table, the Jewish people have a proud legacy of age-old kings and queens. It’s just that our tradition goes back a few years earlier. Since King David laid the cornerstone for his palace in the 10th Century BC, Jerusalem has served as the heart of our faith. In debate after debate, speakers sit in the Security Council and say that Israel is committing “ethnic cleansing” in Jerusalem, even though the percentage of Arab residents in the city has grown from 26% to 35% since 1967. All of these communities were wiped out. Age-old family businesses and properties were confiscated. Jewish quarters were destroyed. Pogroms left synagogues looted, graveyards desecrated and thousands dead. The pages that the UN has written about the Palestinian refugees could fill up soccer stadiums, but not a drop of ink has been spilled about the Jewish refugees. Out of over 1088 UN resolutions on the Middle East, you will not find a single syllable regarding the displacement of Jewish refugees. There have been more than 172 resolutions exclusively devoted to Palestinian refugees, but not one dedicated to Jewish refugees. The Palestinian refugees have their own UN agency, their own information program, and their own department within the United Nations. None exist for the Jewish refugees. The word “double-standard” does not even begin to describe this gap. This discrepancy is very convenient for some in this Chamber, but it’s not right. The time has come for the UN to end its complicity in trying to erase the stories of 850,000 people from history. The time has also come to speak openly in these halls about the Arab World’s role in maintaining the Palestinians as refugees for more than six decades. Jews from Arab countries came to refugee camps in Israel, which eventually gave birth to thriving towns and cities. Refugee camps in Arab Countries gave birth to more Palestinian refugees. Israel welcomed its Jewish refugees with citizenship and unlocked their vast potential. As they rose to the highest levels of society, our refugees lifted the State of Israel to new heights. I’ve saved the most obvious myth for last: The myth that peace can somehow be achieved between Israelis and Palestinians by bypassing direct negotiations.History has shown that peace and negotiations are inseparable. Direct negotiations are the only tool, the only way and the only path to create two-states for two peoples. Last January, Israel offered a clear proposal in Amman for restarting direct negotiations. We presented the Palestinian delegation with negotiating positions on every major issue separating the parties. This week we will observe the two most significant public holidays in Israel – our day of remembrance and our day of independence. On Wednesday, sirens will sound across Israel. For two minutes, everything will come to a halt. People will stop in their tracks, cars will pull over to the side of highways, and the entire country will pause to remember the more than 22,000 Israelis who have been killed by wars and terrorism in our nation’s short history. On Thursday, we will celebrate the rebirth of the Jewish nation – and our 64th year as a free people in our ancient homeland. Against persistent threats and overwhelming odds, Israel has not only survived, but thrived. We intentionally commemorate these two days one after another. As the Israeli people celebrate our independence, we carry the heavy weight of great suffering and sacrifice. The lesson we take from these days is clear. We can never turn a blind eye to the dangers around us. We cannot pretend that we live in a stable region filled with Jeffersonian democracies. But there is another lesson that will fill the hearts of Israelis this week. We can never, ever give up hope for lasting peace. The price of conflict is too high. The evil of war is too great. That is the fundamental truth which guides our leaders. In the dangerous uncertainty of a turbulent Middle East, the Security Council has never had a greater responsibility to separate myth from truth, and fact from fiction. The clarity of candor has never been more valuable. The need for honest discourse has never been clearer. It is time for this Council to sweep out the cobwebs of old illusions – and plant the seeds for a truly “open” debate on the Middle East. The challenges before us demand nothing less. Previous Post Previous Post CHAOS IN CAIRO AS PRESIDENTIAL ELECTIONS DRAWS NIGH……..